Up until now there have been very few options for using a TV in a business location. Turning on cable TV results in a lot of doom and gloom news stories and unpredictable content. 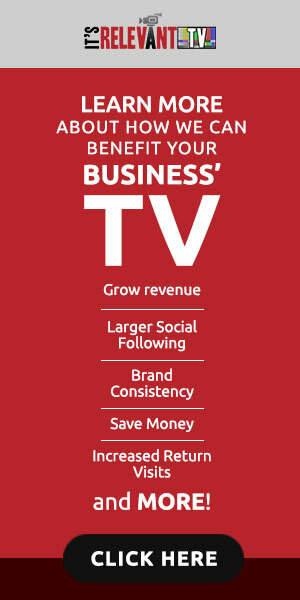 Even worse for your business, cable TV delivers countless competitive ads that draw customers away. Some businesses have tried using their televisions as digital signs. But plain old digital signage is BORING and often ignored. Some pre-programmed video packages are available also, but those bring a repetitive loop that can frustrate customers. Finally, there is a solution! It’s Relevant TV takes a fresh approach to help you take control of your TV. For a business, the true power of television is the combination of interesting content and well-placed advertisements, and It’s Relevant TV puts that power within reach of every business owner. From local retailers, medical offices, restaurants, and salons to sports arenas, theaters, hotels and car dealerships, the custom channels work uniquely for each and every location. It’s Relevant TV for tvOS brings the power of the company’s custom TV networks to any owner of a 4th generation Apple TV device. The service combines the best aspects of television, social media and digital promotions. In addition, the service allows business owners to control them all from their computer, tablet, or smartphone. It offers greater control than any other TV product available today. Businesses choose the types of content they want to display to their visitors from a vast library of licensed content. They can also upload their own messaging, images, and videos to show. In addition, they can decide which social media updates to display from their own accounts, and It’s Relevant TV does the rest. It’s Relevant TV automatically delivers fresh video content throughout the day, updating the promotions and social media as each business makes changes in their account. Businesses are also excited about what It’s Relevant TV blocks from the broadcast: competitive ads. With Competitive Ad Block® from It’s Relevant TV, all advertisements from competing businesses are blocked from reaching the screen. All you need is the free application from the iTunes TVOS store, and an access code from It’s Relevant TV. Search “it’s relevant tv” on your Apple TV) to download the app. If you don’t already have an access code please email support@itsrelevant.com to get one. Today is the day you will make your TV worth something. We look forward to providing you with the tools to make it happen.